Geoaesthetics of the Present: Towards a New Spatial Turn? La estética y la ética del cuidado; ¿Quién se hace cargo de los bebés, los enfermos y los ancianos? Any diagnosis about globalization is associated with a set of subjects, practices and institutions whose activity -or whose agreements and alliances- shape our World-System one way or another. Issues such as the “Ideological Apparatuses” that determine global politics and economy, the positioning of regions and locations in centers or peripheries, or the transformations of the productive sphere are realities that define the development of a social totality increasingly dependent of processes of transnational scope. In fact, one could say that the “displacement” of these processes -that are intertwined both with geopolitics and the economy- would come to express the inherent complexity of “contemporary being”. Based on these premises, the Second International Conference Critical Cartography of Art and Visuality in the Global Age intends to map a scenario where politics, geography and economics have gained a decisive role in contemporary art practices. Thus, the key policies that articulate our cultural present are set in context; this suggests not losing sight of the “artistic impact” of conflicts that have come to revive the potential of the common action. Alongside this, the geoaesthetic dimension will be reclaimed to interpret those practices that are likely to redefine -or at least to question- the relations between center and periphery. Finally, both politics and geoaesthetics may serve to consider critically the phenomenon of work reorganization; especially the policies that “locate” the gender in a specific coordinates. Thus we have politics, geoaesthetics and labour; three ways to interpret artistic practices and everything that competes with them -in order to establish a dialogue with questions deriving from disciplines such as Visual Studies, postcolonial criticism or political ecology -without discarding gender issues and New Materialism. Only from this deliberately interdisciplinary engagement will it be possible to renew the critical art potential and the discourses proposed through artistic praxis. This way, the Second International Conference Critical Cartography of Art and Visuality in the Global Age wants to continue investing in a methodology that serves to interpret a world whose principles -or paradigms- outline a new horizon: albeit, ultimately, a horizon that poses more questions than answers. For some time now, numerous artistic practices have realized the political potential of a presumed “new” social subject: the multitude. This category begins with the observation of the crisis of power structures linked to modernity and the advent of a hypothetical “polycentric” world order -a scenario that would have favoured the emergence of a social multiplicity capable of acting as a common agent of biopolitical production. This panel seeks to address the implications of a diagnosis inseparable from the idea of crisis; both regarding its possibilities and its contradictions and problems. Based on these premises, issues such as the political dimension of an art intrinsically linked to crisis could come into consideration; the development of action forms related to artistic praxis; or the “institutionalization” of the recent protests by the “art world”. 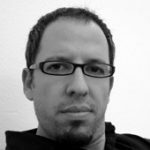 Towards A New “Spatial Turn”? The realization that space is crucial to consider our contemporaneity is manifested in the multiple diagnoses that have registered a “spatial turn”. It seems symptomatic that artistic practice and discourse incorporate this interest from one perspective or another, even moving towards the production of categories likely to raise new epistemological paradigms. This is the case with “geoaesthetics”, a “discipline” that, among other things, is based on the critical consideration of spatial reality -in a “material” sense of the term- as a topos where artistic discourse is received and emitted. Taking these premises into account, this panel proposes a hypothetical “geoaesthetic condition” to address its cultural and political implications, its relation to practices and lifestyles that are being spread -or settled- across an increasingly complex territoriality, as well as their connection to approaches related to postcolonial criticism or ecology. Work reorganization in “advanced” economies has led to the incorporation of women into the sphere of paid employment; however, the “old” gendered division of labour still conditions their social role one way or another. The specialization in domestic “care”, wage discrimination and sexual exploitation -in its multiple variants- are simple examples that reveal inequalities constantly challenged by feminist criticism. This panel intends to discuss and question the “cultural” role of women from the perspective of work reorganization; in this course, issues such as potential “mutations” in the field of social reproduction, the proliferation of “circuits” of exploitation and discrimination in the workplace, or the margin of commitment that can be given within artistic practices will be brought up into discussion. 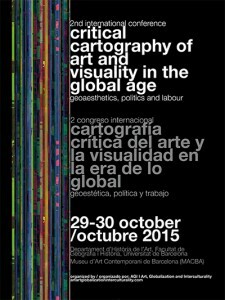 Welcome and presentation of the 2nd international conference on critical cartography and visual art in the age of global by Anna Maria Guasch and Rafael Pinilla at the University of Barcelona (UB) On October 29, 2015 in the Aula Magna of the Faculty of Geography and History UB. 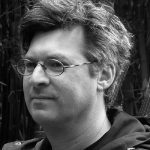 Conference: Geoaesthetics of the Present: Towards a New “Spatial Turn”? Joaquin Barriendos lecture at Columbia University moderated by Marti Peran, University of Barcelona (UB) within the 2nd International Conference on Critical Cartography of Art & Visuality in the Global Age on October 29, 2015 in the Aula Magna the Faculty of Geography and History UB. Keynote convened by Juan Vicente Aliaga from the Universitat Politècnica de València (UPV) within the 2nd international conference on critical cartography of art and visuality in the global age on October 29th, 2015 at the Aula Magna of the Faculty of Geography and History University of Barcelona.